For those that arrive from Google: You probably shouldn't get the nonces from the REST API, unless you really know what you're doing. Cookie-based authentication with the REST API is only meant for plugins and themes. For a single page application, you should probably use OAuth. This question exists because the documentation isn't/wasn't clear on how should you actually authenticate when building single page apps, JWTs aren't really fit for web apps, and OAuth is harder to implement than cookie based auth. The expected result is two new posts, but I get Cookie nonce is invalid from the first one, and the second one creates the post succesfully. That's probably because the nonces are different, but why? I'm logged in as the same user in both requests. If my approach is wrong, how should I get the nonce? $uid = (int) $user->ID; // This is 0, even though the verify endpoint says I'm logged in as user 2! Take a closer look at the function rest_cookie_check_errors(). That's why you're getting a different nonce from your REST call vs getting it from the theme. 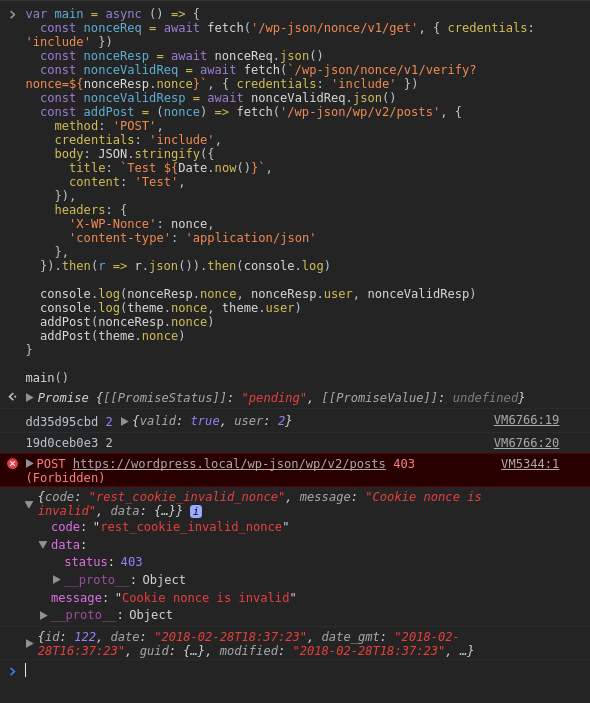 The REST call is intentionally not recognizing your login credentials (in this case via cookie auth) because you didn't send a valid nonce in the get request. Now, the reason your wp_loaded code worked was because you got the nonce and saved it to a global before this rest code nullified your login. The verify fails because the rest code nullifies your login before the verify takes place. While this solution works, it isn't recommended. OAuth is the preferred choice. I think that wp_verify_nonce is broken, as wp_get_current_user fails to get the proper user object. It isn't, as illustrated by Otto. If you spot a security problem with the fix, please give me a shout, right now I can't see anything wrong with it, other than globals. Looking at all this code it seems like your problem is the use of closures. At init stage you should only set hooks and not evaluate data as not all of the core had finished loading and being initialized. As always with anything hook in wordpress, use the latest hook possible and never try to precalculate anything you don't have to.